Via the sweet smArtHistory site, we take you this morn to beautiful Firenze--Florence, Italy! 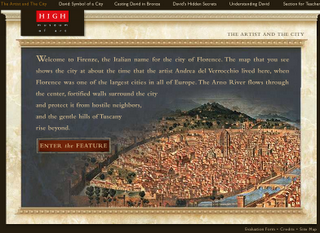 This beautiful interactive lets you explore Florence, learn about the city and its leaders, including the Medici who funded much great art; and explore daVinci's tale of being an apprentice for Verrocchio. I wanted to say a bit about this last, the Apprentice's tale. Its a wonderful connection, as daVinci's name is much more known to students and parents than Verrocchio's. Yet here is an opportunity to reach more kids. On first sight, The Apprentice's Tale grabbed me as an exciting opportunity to connect kids to young artists. Yet the tale is told in daVinic's own words--the words of an old master remembering back to his early apprenticeship. Wouldn't it be great to tell the tale from a young artists perspective? To fill in the wonder and awe and confusion of youth, to add the details of how tough it was, to relate more to the current students own struggles? I say this not as criticism of this wonderful work, but as suggestion for a way forward. We used to do this for students. And they learned history. Now we give them boring declarative descriptions of isms, eras, themes, and much they are not yet ready to make theirs. More stories with personal touches would go a long way to bootstrapping an interest in history. This week I was invited to join this new Ning network about social studies. It looks cool if it really gets going; different groups are set up for US history, Civics, etc. Its run by Tom Daccord, who writes and speaks on technology use and integration, so one can expect a good strong focus on the methods of learning we look at here.